In which your humble correspondents plough onwards through the thick of Kings Street Thai-foodery only to come hard up against the gritty underbelly of Sydney street crime. First things first though, before we get all gritty and crimey. Thai La-Ong 2 is not so much a sequel to Thai La-Ong, as an annexe of it – with yellow walls instead of green. The menu is the same, the food is the same, with the same degree of deliciousness, the staff are the same – we had the same waiter, and the bill is of the same degree of lowness that you will be shaking your head in wonder. Go to either. They are good. Go on, go now, you can choose between yellow and green. We are joined by Stropolina tonight to entertain Fiona and Renald, guests from Canberra. They are ex-neighbours and old friends, whose kids and ours used to ricochet from house to house in a tight little playgroup pinball. Until they all grew up and began bouncing around the planet instead. Fiona and Renald are keen to join us on the quest, and we are reasonably confident that Thai La-Ong 2 will at least be good enough that we are unlikely to risk permanent damage to the friendship by inflicting it on them. We are greeted with yellow walls and prawn crackers at the restaurant. It is smaller and emptier than it’s partner, which is good as none of us have 20-20 hearing anymore and there is a fair bit of catching up to be done. Hilarity ensues, with tales of old friends and new lovers, Bambi and Thumper, twitterpation – nothing to do with the internet apparently, summer camp employment, young people in general, and arguments over the menu. We have already tried number 37 up the road, so should we go for 73? Or maybe 10 (3+7 – I had to have it explained to me). Then Renald arced up, demanding a whole snapper, and Strop took command of the ordering to prevent an outbreak of chaos. She was doing relatively well until she got distracted by the shiney little shrines dotted around the restaurant and felt the need for a bit of cultural enrichment and education. Soon she had the waiter stretching his limited English vocabulary trying to explain the various statues, pictures and little fabric banners with green crocodiles on them. Ironically we learned that Thai crocodiles have a propensity for gobbling up cash at the same time that a couple of home-grown Newtown crocodiles were helping themselves to Fiona’s cash. The first we are aware that something is wrong is after the young couple seated behind Strop and Fiona leave abruptly without ordering. 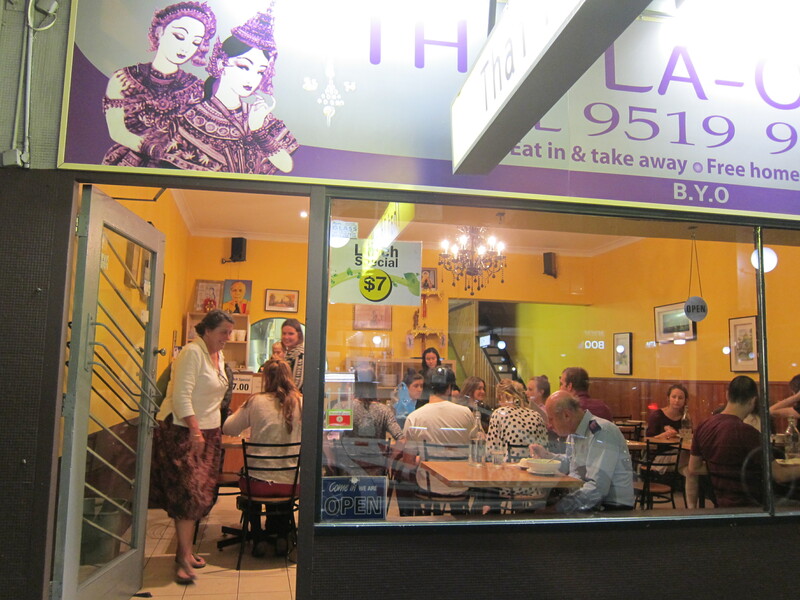 Then the manager from Thai Riffic next door comes in and the staff gather at the front of the restaurant. They are suspicious, they ask Strop and Fiona to check their bags, the ones hanging invitingly open on the backs of their chairs. At least the Newtown crocodiles only took the cash. They left the wallets, cards and phones. In hindsight of course we are all experts on how suss the crocodiles looked – that girl was totally off her face – I thought there was something dodgy about them – didn’t you think it was weird how they chose to sit right behind us – she was pretty though – pity she’s buggered up her life. But unfortunately no one actually saw anything and no one said anything about their suspicions when it might have been useful. We weren’t on our guard. We weren’t in a foreign country. We were having a lot of fun. Oh well, we probably got off lightly – how silly, leaving our bags unzipped – what bastards. While we are waiting for the cops the food arrives and distracts us with yumminess, especially the rich beef Gang Masamun and the aniseedy fish, Pla Rard Prik. After gelatos at Gelatomassi, where we are exorted by the proprietor to “sit out the front and make my place look busy,” we finish off an eventful evening with a visit to Newtown Police Station. While Fiona and Strop are giving their statements I check the photos on my phone and realise I have taken a photo of one of the crocodiles. I thought this was a major breakthrough in the case, even if it was poorly lit and largely out of focus, but the police didn’t seem as excited as me. CSI Newtown will have to wait. Next up is Thai Riffic, our first pun and our last Thai for a little while. I can’t wait, but we will be keeping our handbags firmly in our laps and our eyes peeled. It’s a jungle out there. Sounds like the basis for a gritty crime novel. I too would have felt like the greatest detective ever if I snapped a snap of one of the snappers! 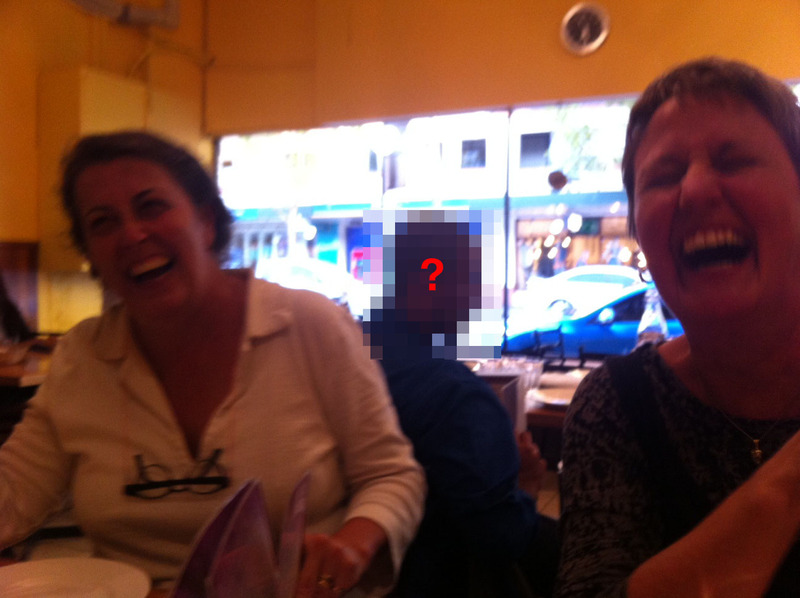 Great story/dinner/what have you…and super intrigued at the possibilities of 37!